Percy Main enjoyed a weekend to remember as the men from St John’s Terrace produced a ruthless display to overwhelm Lanchester. Captain Barry Stewart lost the toss and had to bowl first on a dry surface, but they got off to the ideal start as the home side’s Dan Nicotra, who made a century in the reverse fixture, was run out without scoring by the second ball of the match. Nicotra tried to work Andrew Green through point but hit the ball straight to Will Taylor. He tried to run and was rightly sent back by his partner. Taylor produced a fast accurate throw to wicket keeper Anthony Hornby’s gloves and he removed the bails with Nicotra still short of his ground. Main only had to wait five overs for the next wicket as Stewart got a delivery to move away from Graham Brinton which he nicked through to Hornby to be out for seven. The next wicket came with the next ball and was a carbon copy of the previous as Daniel Storey edged through to Hornby. Stewart struck again two overs later with a delivery that cut back off the seam to bowl Kieron Taylor for 11. Stewart’s opening spell gave him 3-21 from seven overs and helped reduce Lanchester to 52-4 after 15 overs. Stewart introduced Dan McGee into the attack after 12 overs and he took a wicket in his fourth as he spun a delivery away from Mark Small which he edged through to Hornby to be out for 26. McGee bowled economically as he went through his allotted 12 overs in one spell and finished with 1-31. This gave Stewart control and allowed him to rotate his other bowlers as he pursed more wickets. A partnership of 53 between Jonathan Hames and Nav Ahmed rescued Lanchester from 66-5. David Anderson broke the partnership with the score at 119 when he had Hames caught at mid-off by Michael Boyd for 43 from 80 balls and which included four boundaries and a six. Anderson took wickets in his next two overs as he reduced Lanchester to 128-8. Ahmed was caught and bowled for 21 and Arran Halliday lbw for one as he finished with 3-26. At 128-8, Stewart hoped to keep the Lanchester score under 150. His opposite number Stuart McPhail gamely went for his shots and made 24 from just 30 balls before Michael Boyd (1-16) had McPhail caught at slip by Green - a spectacular one-handed catch diving to his left. With Lanchester 152-9, Stewart put himself on to bowl in search of the final wicket, and the decision was rewarded when he bowled Nathan Somersall for one. 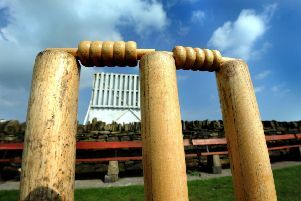 The final wicket gave Stewart 4-33 from just 9.4 overs as Lanchester were bowled out for 158. Percy Main’s openers Hornby and Anderson got off to a great start as both hit boundaries in the opening two overs. Anderson batted patiently as Hornby was positive in his approach and looked to score off any ball that was pitched short. He hit nine boundaries in his first 40 balls. The pair added 75 for the first wicket in 17 overs before Hornby departed for a run a ball 43. He tried to drive a delivery from Kieron Taylor and was caught behind by Storey. Will Taylor, making his Percy Main debut, came in at number three and looked assured as he rotated the strike well as he settled in. Taylor and Anderson brought up Percy Main’s 100 in the 23rd over as both began to be more positive in their shots. Taylor attacked the bowling of Nicotra, hitting him for two sixes and a four to compound the Australian’s miserable afternoon after being run out second ball of the match. He finished with 0-47 from seven overs. Anderson brought up a 92-ball half century with the score at 147-1 in the 32nd over, and he ended the match nine balls later as he drove Kieron Taylor for four to give Percy Main a nine-wicket victory. Anderson finished 58 not out and his innings lasted 96 balls and took 120 minutes. Will Taylor finished 34 not out from just 41 balls. He hit one four and two sixes in his 59-minute innings. Percy Main’s next home game is on Saturday, August 13, at home to Benwell & Walbottle.